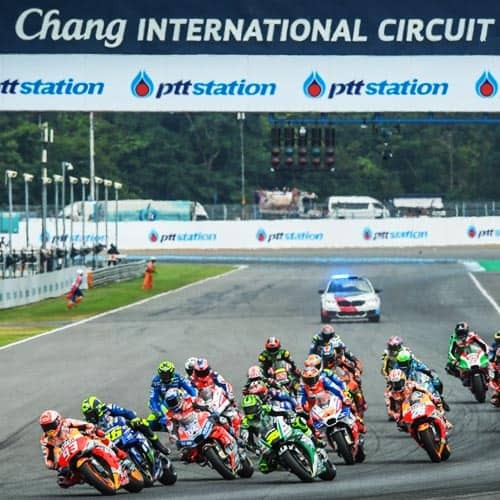 The PTT Thailand Grand Prix 2019 will be just the second staging of a MotoGP round in Thailand and there’s little doubt that it will be the best with the event organisers sure to have learnt a thing or two from the inaugural race in 2018, and they’ll still be very keen to impress to retain the race’s place on the MotoGP calendar for 2020! Not to mention that the mercurial Jorge Lorenzo will have had most of the 2019 season to acclimatise to the Repsol RC213V by the time Thailand rolls around, and therefore should be taking the fight right up to teammate, 6-time World Champion, Marc Marquez. Plus, 2019 will see the debut of what’s sure to be a powerhouse contender in the Petronas-backed (yep, the same Petronas that backs the 4-time running World Champion Mercedes-AMG F1 team), Sepang International Circuit Yamaha team, which will be piloted by two of the hottest talents in MotoGP in Franco Morbidelli and Fabio Quartararo. And last but not least, all the exciting changes aren’t going to come from just the main category – 2019 will also see the debut of the Triumph 765 triple in the Moto2 class! The Triumph triple is one of the best sounding bikes on the road, so we can’t wait to hear 30-odd of them at full volume at the track! The Buriram International Circuit is located in the Buriram Province, about a five hours drive North-East of the nation’s capital, Bangkok. The circuit was opened in 2014 and is Thailand’s first FIM Grade 1 and Grade A circuit. The circuit’s grandstands hold approximately 50,000 people, whilst another 50,000 people can stand around the circuit. 4.5km in length and featuring 12 turns and two straights (one of which is 1km in length), the circuit was designed by renowned German track designer, Herman Tilke with the brief that the amount of track that can be seen from the grandstands is maximised. Due to this brief, the unusual decision to build the pit garages underneath the grandstands was made. If you’d love to be there LIVE at the Buriram International Circuit (otherwise known as the Chang International Circuit) to experience the 2019 edition of the Thailand MotoGP, please take a moment to select a package below and then complete the Enquiry Form. One of our friendly travel experts will then respond to your enquiry shortly to discuss the packages and your travel requirements in further detail.